Plans have been drawn up to erect statues of trade unionist Inez McCormack and civil rights campaigner Paddy Devlin. There has been a push for more memorials to women and nationalists since the publication of an equality report on the issue in 2012. But Sinn Féin says the new plan does not go far enough and will seek a legal opinion. The party voted against proposals at a city council committee on Friday. Its councillors are angry the plan does not include a permanent tribute to Winifred Carney, a suffragette and trade unionist who acted as secretary to James Connolly in the 1916 Easter Rising. The Sinn Féin leader on the council, Ciarán Beattie, said: "The days of republicans not being about City Hall are over. "We are going to get legal opinion on this." DUP councillor Lee Reynolds supported the plan, describing it as balanced and fair. He said he welcomed the fact that it included a tribute at the City Hall to the bomb disposal squad, plus a Belfast Blitz memorial in the city centre. Although the plan does not include a permanent tribute to Winifred Carney, it is proposed that she be recognised in a time-limited installation at City Hall. 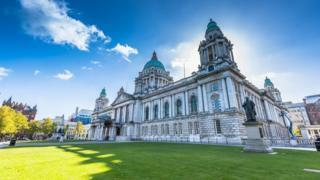 Alliance Party councillor Michael Long said: "We are trying to make sure that the City Hall grounds are more representative of the people in Belfast. "We think this is a deal that is good for everyone in the city." Once completed a total of six statues will be placed at City Hall, with the installations of Inez McCormack and Paddy Devlin being permanent, and four others being temporary bench statues. Plans are for the four temporary statues to be placed at locations around Belfast after their time at City Hall. Alongside Winifred Carney, the three other time-limited installations will include the first female Lord Mayor of Belfast Grace Bannister, Presbyterian industrialist and Irish language speaker Robert MacAdam, and republican Mary Ann McCracken. It is also proposed that the statue of Winifred Carney will include her husband, Somme veteran and unionist George McBride. These names are yet to be finalised. The plan will now go before a full meeting of the council for approval in early February. There will be a public consultation before any works begin.